NAIROBI – The government of Kenya is facing the reality that it may soon need to delay a number of development projects around the country, due sharp a sharp decrease in the collection of tax revenues in the country. The Kenya Revenue Authority (KRA) recently released its latest Revenue Performance Report, detailing the country’s tax collections during the first half of the 2011 – 2012 financial year, and showing that the government’s cumulative tax revenues in the time period were below previous projections by KES 45 billion, reaching a total of KES 345 billion. The Commissioner General of the KRA Michael Waweru suggested that the lower than expected tax revenues were a result of an economic slowdown caused by high inflation, rising interest rates, significant fluctuations in the value of the national currency and by increasing oil prices. He also said that the unfavorable economic conditions which led to the revenue drop would persist throughout the third quarter of the financial year. Tax experts in Kenya have noted that part of the decrease in revenues was also caused by tax changes introduced by the government, particularly due to a hike in the rate of excise duties on alcoholic beverages, which led to significant drops in sale of alcohol. In the second quarter of the financial year, Kenya also saw a KES 10 billion drop in funds received from international donors. 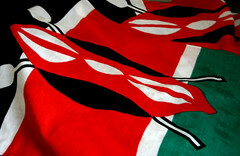 According to the opinion of experts of the Institute of Economic Affairs of Kenya many international financial organizations believe that the government has not adequately met its obligations to release the funds to development projects in Kenya. The decreased tax revenues have raised public concerns that the government will soon need to scale back its own funding of infrastructure development around the country until economic conditions improve.